If you ever wanted to be a spy, you probably tried to learn Morse code as a kid. But have you ever considered that the dots and dashes also make a great decorative element? 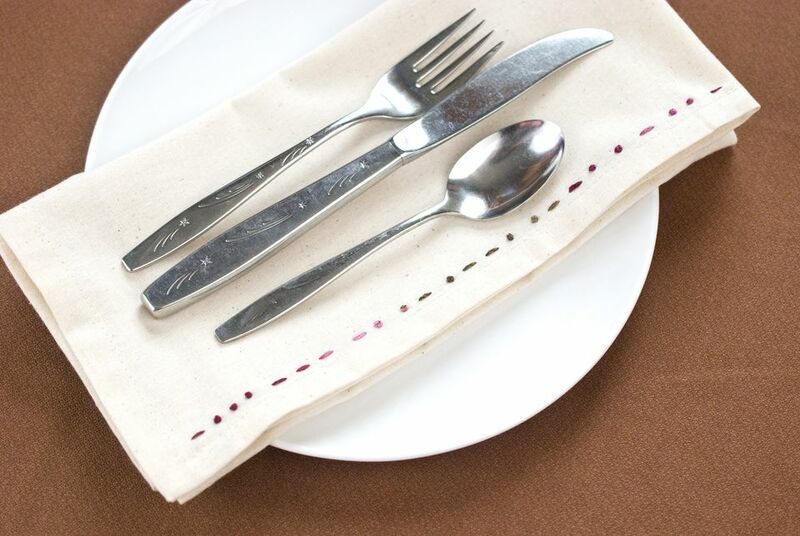 Turn basic dinner napkins into a secret message with just a few stitches! These embroidered napkins are so fast and easy to make and they're also a great conversation starter. The embroidery takes on the look of a simple border, and depending on the message, it may even form a pattern. But hidden within the stitches is a word or phrase, and it's up to those around the table to decipher it! Of course, this idea transfers to other items too. Stitch a love note on a hankie, a name in the hem of some clothing or anywhere you want to hide a secret! Ready-to-stitch Napkins - Napkins designed for embroidery make stitching easy and pleasant. However, any cloth napkins that look like you can stitch on them will work for this project, though all cotton is typically a good choice. Or, instead of buying them, make your own napkins with a fringed edge. Be sure to wash and dry the napkins (or fabric if making your own) before adding the embroidery. Embroidery Floss - Any embroidery floss or perle cotton will work for this project, but it's a perfect opportunity to use some variegated thread so that the message changes color. The example above uses DMC's Coloris floss. Choose a word or phrase and translate it into Morse code. "Eat up", "dig in" or "delicious" are some food related messages to consider, but you might choose a phrase that is related to a holiday meal or even a last name to make the napkins customized in code. You only need to stitch the dots and dashes. The slashes ( / ) show the space between letters and the double slash ( / / ) is the space between words. Be sure to leave a gap in your stitching so you can see where letters start and stop! If you choose to stitch along the edge of the napkin, use the hem as a guide for keeping your stitching straight or use a water-soluble pen to draw a line as a guide. Embroider the message with straight stitches and Colonial knots. French knots will also work, but Colonial knots are a little tighter and will hold up to repeated washings better. The sample uses all six strands of floss and large straight stitches. For a smaller design, use fewer strands and keep the stitches smaller and closer together. Embroider all of your napkins with the same message or choose something unique for each one. Fold the napkins so that the message shows. Some fancy folds won't work for this, but others are perfect. You might even want to think about how you'd like to present your napkins before you choose a location for stitching the spy code. Your guests may think that the embroidery is purely decorative, but you'll know that it's really communicating a message. If you want to add an activity to your meal, challenge the people around your table to figure out what their napkin says. Now you're ready to entertain and perhaps pass a few secret messages along the way!